Home » News of the Mumonkan club » The results of the training season 2013-2014 in Mumonkan. Dear friends and colleagues! Yet another Aikido Mumonkan Club training 2013-2014 season is over. Traditionally let's briefly summarize its main results. Our students have taken part in the annual aikido training qualification seminar led by Mr. Ito Makoto, instructor of the World Centre of Aikido Aikikai Hombu Dojo. The key feature of the seminar's that it's been for the first time ever that it was held in two Belarusian cities: in Maladzečna and in Minsk. In April 2014, Mr. Alexander Nestiuk, the Mumonkan club instructor, successfully passed a certification exam for the 2 Dan Aikido Aikikai. We congratulate Alexander and wish him every success in the Aikido mastering. Twenty more members of our club have successfully passed various qualifying examinations for the student degrees in the past season, too. Six people of them got 3 Kyu, one had 4 Kyu, nine people got 5 Kyu, and nine people got 6 Kyu. Accept our heartiest congratulations! We wish all qualified health and good luck! 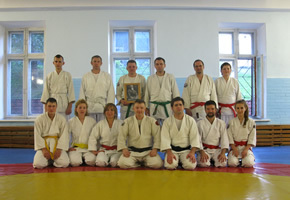 The Aikido regular trainings in the Navapolatsk Mumonkan Club branch have resumed after almost a year break. For more information on the classes time and location, see the "Schedule" page. There was O-Sensei Morihei Ueshiba's, the Aikido Founder, 130th birth anniversary on December 14th, 2013. The Mumonkan Club celebrated this date with a two-day Aikido seminar. You can see the pictures of it in our photo gallery. 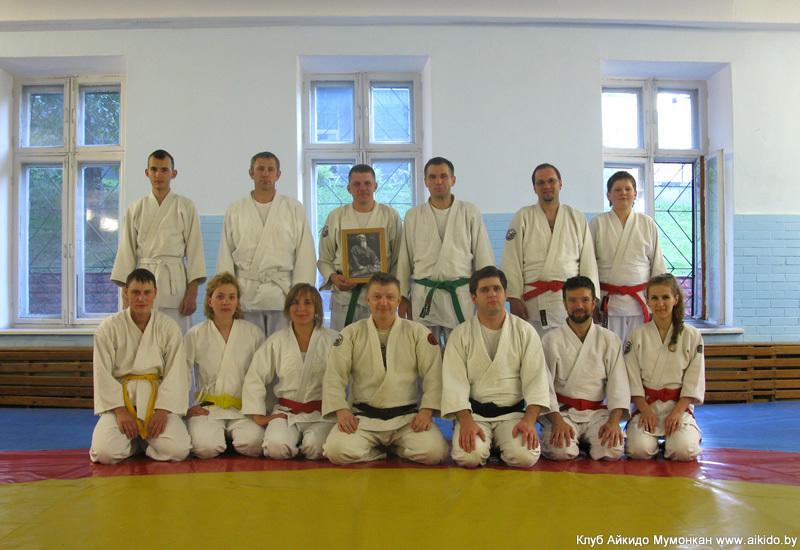 A "Vestnik Naftana" reporter visited an Aikido training in Navapalatsk Mumonkan Club branch. The result of this visit is an item titled "Geometry, physics and common sense learnt in Aikido lessons" (in Russian) published in the newspaper (# 26/336 of June 28th, 2014). Dear colleagues! Our Mumonkan club has a summer vacation from July 1st to August 10, 2014. There will be no trainings in Minsk during this time. The date and time of the new Aikido training term will be preannounced. Should you have any questions, please contact us by e-mail contact@aikido.by. We wish you sunny July days, nice holidays, and unforgettable experiences! We look forward to you in our trainings in August! The results of the training season 2012-2013.